It’s the first cocktail recipe on Natural Comfort Kitchen! Cheers! I hope you’re having a lovely Wednesday that is warmer than mine. It’s barely below 30 degrees here in CT, but I cannot get warm. It’s just been constant sneaking around Steve to try to get the house above 75 degrees, either by frying doughnuts, running the fireplace for five hour stretches, and inching the thermostat up one slow degree at a time. What? It’s 76 in here? Wasn’t me. When that fails, you can find me in an outfit similar to last night’s ensemble of heavy socks, yoga pants, a flannel, and a rather thick sweater. Indoors. And the fuzzy blanket I’m currently wrapped in at the dining room table, aka my office. I intended to post this recipe last Friday, just in time for weekend brunches, but I got a cold which demanded as much sleep as logistically possible. Plus I might have been busy working on a deep fried doughnut surprise, coming soon to a blog near you (this one). It was worth the sacrifice, if the number of doughnuts I stuffed into my face is any indication. Just a word of warning, though, babysitting yeast dough is a commitment. It delayed me from going out to do a little socializing on Sunday night, then forced me to wake up at 7:30 on the Monday of a “three day weekend” to roll it, cut it, rise it (again), and fry it up at a very precise temperature. You have to know the amount of work going into it, but as long as you get that, the results are fresh and fluffy and warm, a combination that’s difficult to come by, even at your neighborhood bakery. But this post is about cocktails, not doughnuts. 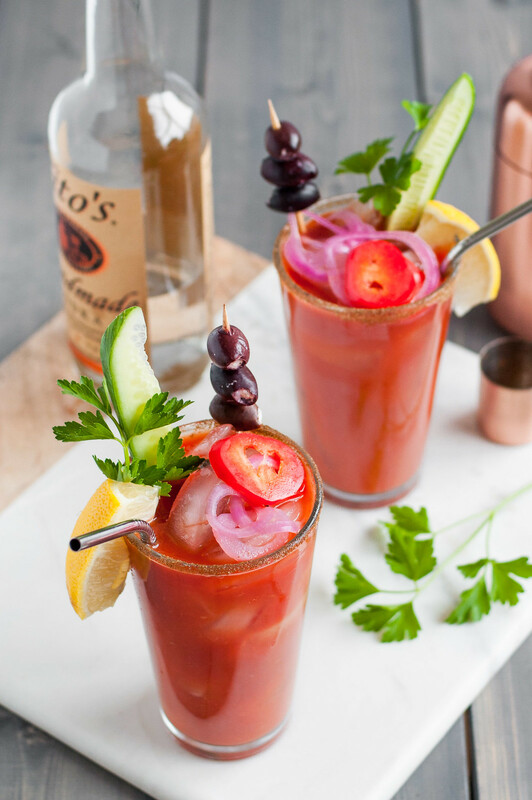 The bloody Mary has gone Greek. 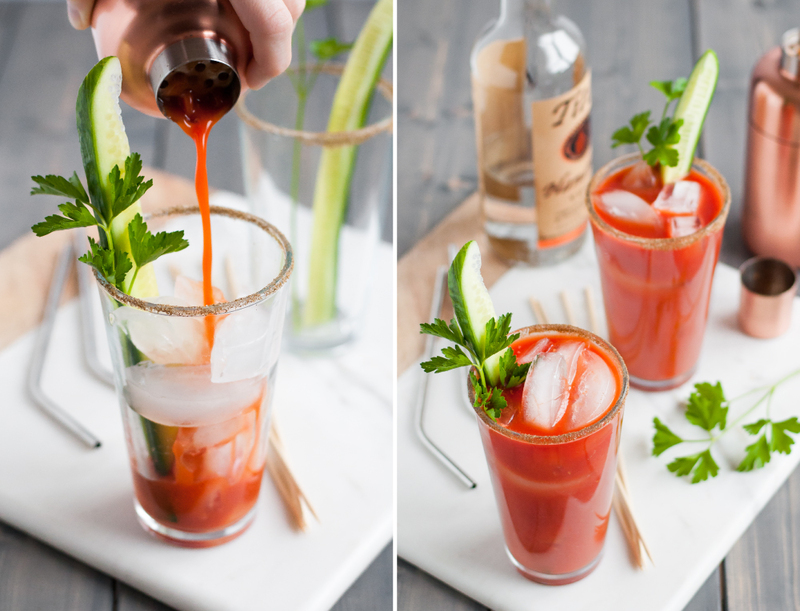 As I researched bloody Mary recipes, a couple things struck me. One, every single recipe contains worcestershire sauce–fun to say, not so fun to consume if you’re avoiding animal products, especially gross fishy ones (hi anchovies). I can understand the value of worcestershire’s flavor profile in some cases, but I knew I could find a way around it here. The combination of kalamata olive brine and soy sauce (or its gluten-free counterpart, tamari) is the answer, the former giving it a teeny bit of tangy bite, the latter bringing plenty of salt to the party. 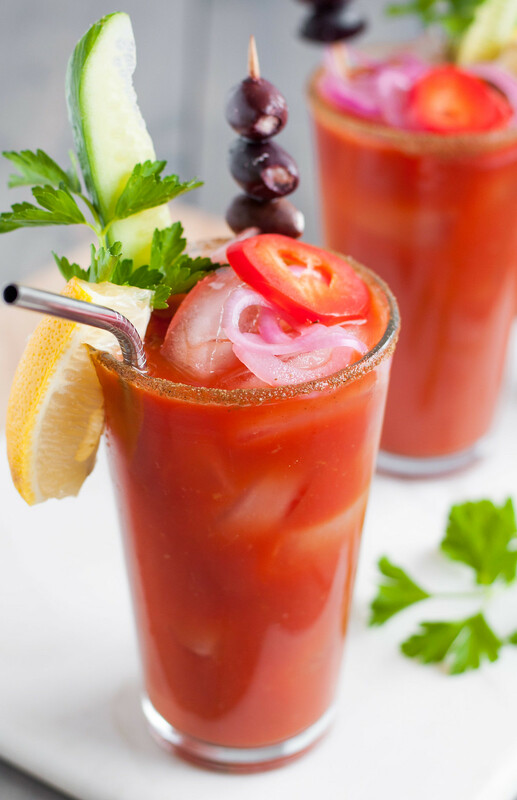 The second thing that struck me about most bloody Mary recipes is that they are so often compared to a boozy salad, which, of course, makes them healthy. My brain started making not-so-far-fetched connections and soon had arrived at this Greek salad variation, mixed with garlic and hot red pepper flake infused olive oil, tart lemon juice, traditional celery salt and horseradish, and, my favorite, grated cucumber to cool everything down and give it a hint of melon-y fragrance that everyone seems to love in a glass of water. The garnishes build on the theme, but don’t let my list limit you. Painstakingly stuffing olives with feta is one of those extra touches everyone will notice, but it’s not vital, especially if you prefer your cheese in bigger chunks. If you like meaty bloody Marys, go for some simple roasted shrimp, and if you keep it vegan, pop some cooked chickpeas on the skewer alongside cheese-less olives. For my theme party lovers, I’m seeing a mostly vegetarian spread. A falafel bar with falafels made and fried the night before, plus a lineup of a few sauces, tzatziki being crucial, harissa and baba ghanoush as my other picks. Spanakopita. A Greek-inspired frittata, also made ahead, of peppers, potatoes, parsley, tomato, and feta. Throw in fresh fruit and a green salad (or just maintain that the cocktail is the salad) and you’re all set. Even without a party, I was surprised by how easy these Greek Marys went down when I taste tested them with Steve last weekend. Apparently I’m not too old to start the morning with something much more aggressive than a mimosa, and the lack of sugar doesn’t make me a jittery, hyper, nauseous mess first thing in the AM. 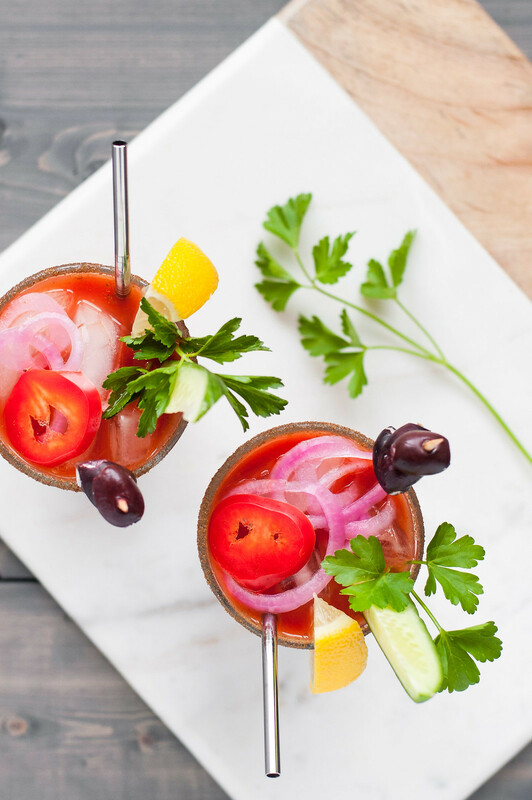 Whether it’s brunch, game day, or every day (ummm, okay, maybe not weekday mornings), the Greek salad bloody Mary wants to join your morning cocktail repertoire. I wanted to say a big huge thank you for checking out my little food blog if you’re new here or have been reading for a while. There have been quite a few newcomers over the past few days, and I know many of you found me via BuzzFeed (!) and the lentil taco salad. I hope you stay a while, take a peek around, and most importantly, find some recipes that make you want to get in the kitchen and make it homemade. 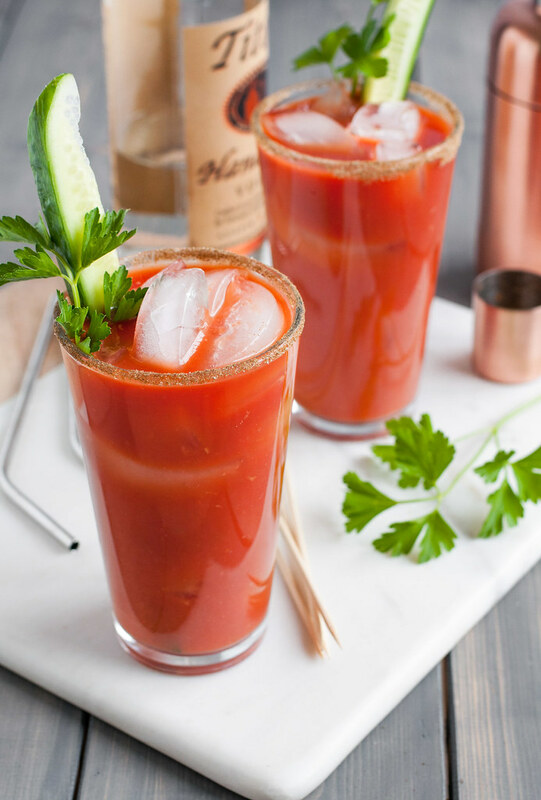 The full, salty flavor of worcestershire sauce is easily replaced with gluten-free tamari and olive brine to make this fresh, savory brunch cocktail vegetarian. Heat oil in small saucepan over medium until very hot. Add garlic and red pepper flakes—they should sizzle and become fragrant quickly. Stir with wooden spoon about 2 minutes, adjusting heat to maintain gentle sizzle, until garlic just begins to brown. Remove from heat and strain through fine mesh strainer into glass liquid measuring cup or small bowl. Place in fridge to cool. Pulse all ingredients except oil in blender on low, until smooth. With blender running (on low!) carefully drizzle in oil until emulsified. Use immediately or refrigerate until needed. 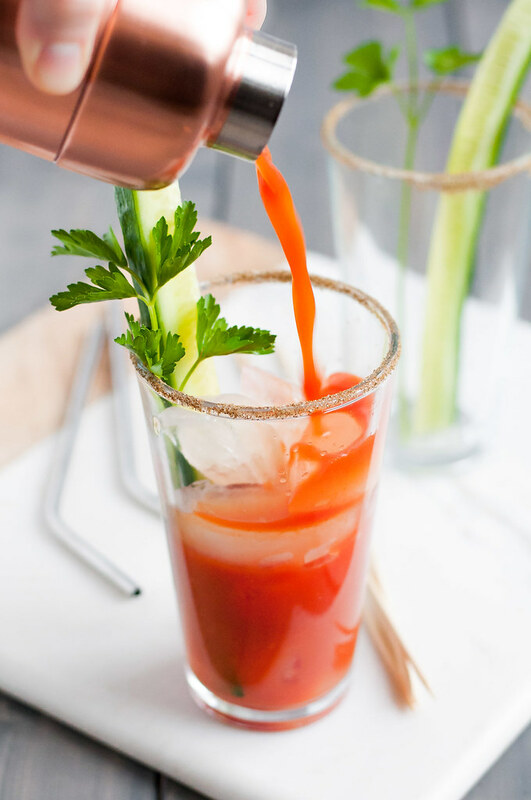 To serve, moisten rim of each glass with a lemon slice, then roll rim in celery salt spread evenly on a plate. Shake one fourth of the mix (or half, if you have a large shaker) with 1½ oz. vodka and a handful of ice until cold (shaker will be frosty). Place large cucumber spear and plenty of ice in each glass. Pour shaken drink over ice. Garnish with feta-stuffed kalamata olives (below) on a skewer (or feta cubes and kalamata olives) and other garnishes of your choosing. For olives, mix a soft (such as Valbreso) or room temperature feta with a pinch of dried oregano and ground black pepper. Drain olives on paper towels. Pipe feta mixture into olives using a sturdy plastic bag with the corner snipped or a small pastry tip (writing tip). Or, push some of the mixture into one end of a disposable straw, wipe off the outside, then insert straw into opening of olive and squeeze feta mixture out of the straw. Both the drink mix and the stuffed olives can be prepared a few days in advance. Gluten-free adaptation: use tequila or a gluten-free vodka, in place of conventional vodka. Vegan/dairy-free adaptation: omit feta cheese (substitute by garnishing with cooked chickpeas). 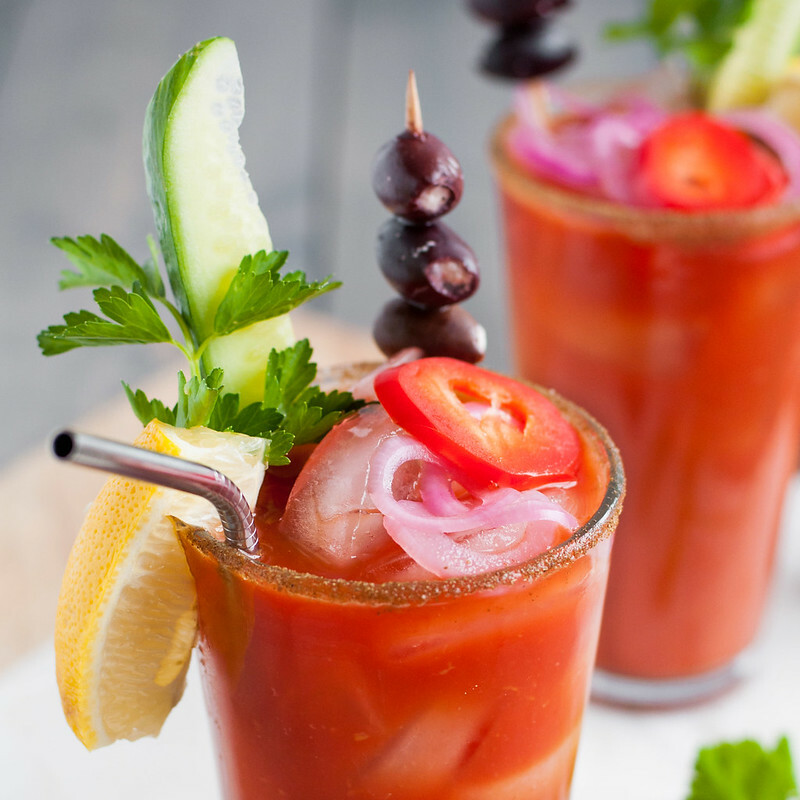 One note on the tomato juice: use the best you can find. I went into this project convinced I would make even the juice from scratch, but that won't add any value unless it's the peak of tomato season. The brand I suggest in the recipe is the one I used, found at Whole Foods in the aisle with the room temperature, bottled juice. Trader Joe's didn't have one when I checked. There are also several of the old school canned varieties on the market, which would work well, too. You want a little salt in the juice--mine had 390 mg of sodium per 8 oz. OMG, that looks amazing! Dinner and drinks all rolled into one! Pinned!!! Haha, if this is all you eat for dinner, please don’t hold me responsible for any consequences :) I like how you think though! Wow, girl! This is absolutely delicious. Something I would love to make with my friends before the morning run! Haha, be careful! If not before, then after for sure! Thank you Kris! There are a few sporadic links to photos of him or us throughout. If you click on almost any of the pictures in the post, it will take you to my (public) flickr account, where you can also see some everyday photos of me, my family, my friends, and of course, my Steve. Cheers!